An overcast but mild Sunday; groups of migrating birds getting ready to head out of here somewhere warmer. Later on the sun started to come out – you need a bit of blue sky to show off the red Autumn leaves that are reaching their peak around now. When we arrived at the house a pheasant was standing in front of the garage. 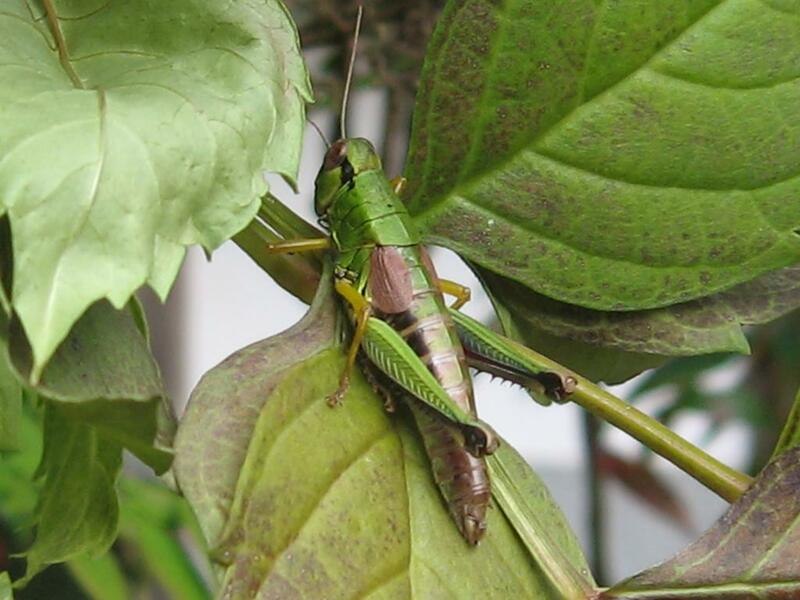 It strolled off into the bushes in its own time… A cricket outside the house: the last one of the year? There were big holes under the tea bushes where the wild boar had been digging for fern roots or something. They left a memento on our drive too. They’re big strong animals and can toss quite large rocks around in their search for something succulent in the ground. T saw a mother and a couple of young a few years ago, but they hadn’t been around much until recently, having pretty much got everything that was going. 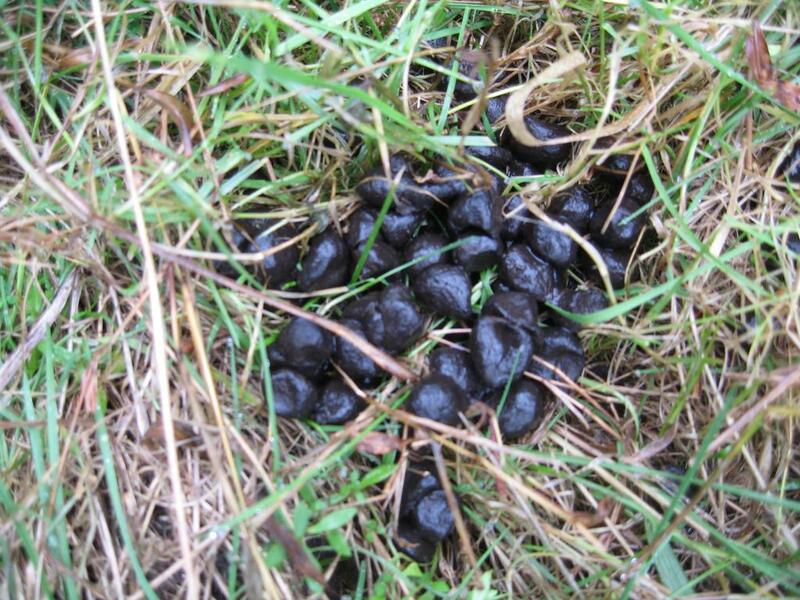 The deer, on the other hand, have been regular visitors, as you’ll know if you’ve been reading this blog for a while, and this week there were plenty of fresh droppings around. Touch wood – they haven’t got inside the net round the chilli patch this year, except for one brief break-in, and now the season’s over. Fingers crossed for next year. 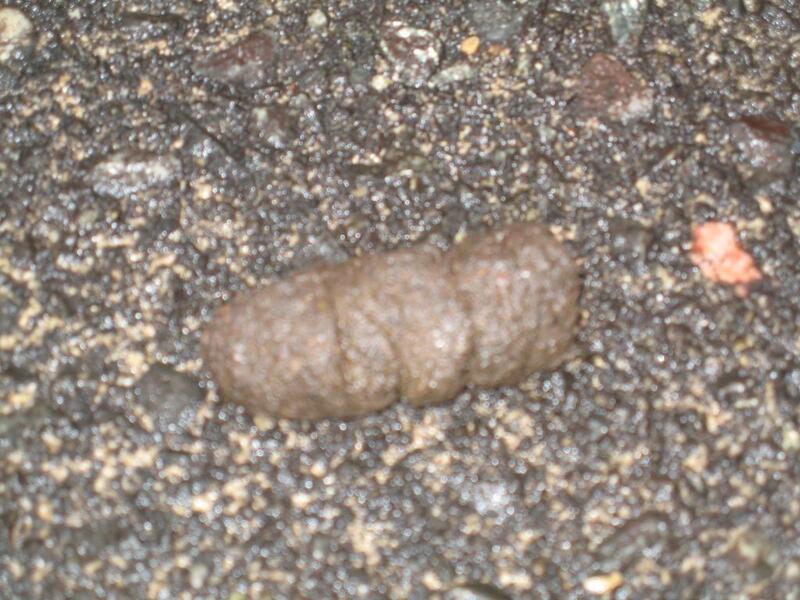 Left by our furry friend. Monday was much colder, and later on turned into drizzle. 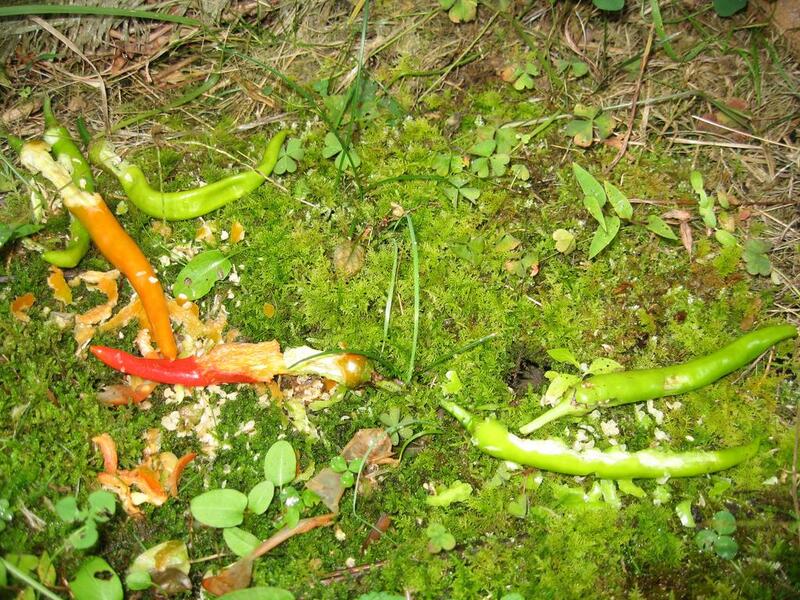 Last week didn’t freeze after all, though it came close, and there were still a lot of chillies intact on the bushes. We won’t be here next week, so a final picking session got another kilo or so of the hot, hot little “ishigaki” chillies. A small furry animal, probably a fieldmouse, had got some of the larger, milder ones and chomped on them in a corner of the field, leaving the seeds, and some half-eaten pods. Maybe they were a bit too hot after all. Anyway, he didn’t even touch the little hot ones. 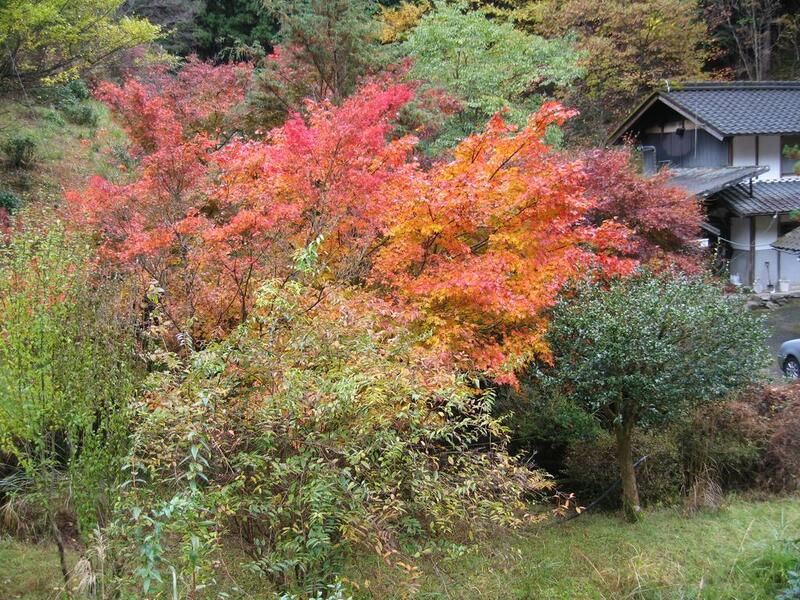 Won’t be back for two weeks, and had a last look at the red maple leaves, which will be gone next time we’re here. A maple in front of the house. The last couple of weeks there have been news reports of bears. Appearing in all kinds of places they shouldn’t – the other day a lady came home to find one in her kitchen – and sometimes attacking people. These are big dangerous animals with sharp claws and teeth and people sometimes get killed. This would have been unheard of a few years ago when all the bears were in the north of the country, but wild animals are becoming a problem in the countryside. Life with things lurking in the bushes has been a regular theme around here though. The first year we arrived there were some nice yams growing in the field, of which I dug up some and left the smaller ones to grow next year. No such luck – the wild boar got to find out about them, and dug all the rest up. We had regular visits from them – they are strong animals and dug big holes in the ground, throwing large rocks about the place. When all the yams were gone, over a couple of years, they tried bracken roots but I think they must have found everything that wild boar like because they don’t come round so much these days. What’s going on? Well, there are various reasons apparently – a big one must be the post-war boom in forestry when a lot of the natural forest was replaced with spruce and cedar plantations: dark dreary places where nothing grows, and nothing can live. This is made worse because there’s no longer any money in it, so everything’s neglected and tangled up with dead branches. Another is that as the rural population dwindles – all the young people moved out to the cities and those who are left are getting old – the villages are also half-abandoned and the area between vegetable fields and forest, the so-called satoyama, is reverting to wildness, so animals can get right up to the fields. Again, there are fewer hunters around now. Young kids aren’t attracted to all the blood and entrails that go with it. Although the weather seems to have been getting warmer for a while now this summer in particular was very hot and the crop of acorns and other things that bears and their friends like was bad. Bears have to have a good feed before they hibernate, so have been forced to check out peoples kitchens. There are hungry bears in the woods.